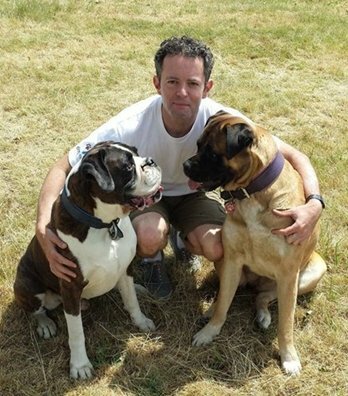 Hi, my name’s Gerry Casey and I'm the owner of Dogknows dog care in Windsor & Eton. I’ve always loved dogs and it was always my ambition to be a vet, but I narrowly missed out on a place at veterinary college at the age of 18 and ended up going in a very different direction with my career. My working background since then has been in the automotive industry, but Dogknows has given me the chance to finally pursue my dream to work with animals. Dogknows is not simply about walking your dog. Our aim is to bring owners and their dogs closer together by helping them better understand each other. All Dogknows services focus on force-free and positive handling methods and we always put your dog’s specific needs first. Whatever your dog's age, I can tailor a service to their individual requirements. We have special services for very young puppies with our puppy 'play & train' visits, followed by socialisation walks as they progress. I can also collect adult dogs and take them in small, well-matched groups for a purposeful and stimulating hour's walk in a local park, so they come home happy, relaxed and well exercised. By choosing Dogknows, you can rest assured that your dog will receive regular and reliable support from a professional dog carer. I am fully insured and DBS/CRB checked. My vehicle is designed to transport dogs safely and is fully air-conditioned to ensure your dog’s comfort in all weathers. Working with dogs is something I find hugely rewarding and I consider myself extremely fortunate to have been finally able to follow my dream. You can e-mail or call me directly or, if easier, send an enquiry form and I'll get in touch with you.